For years now I have been wanting to make a ballestrino and now is the time. 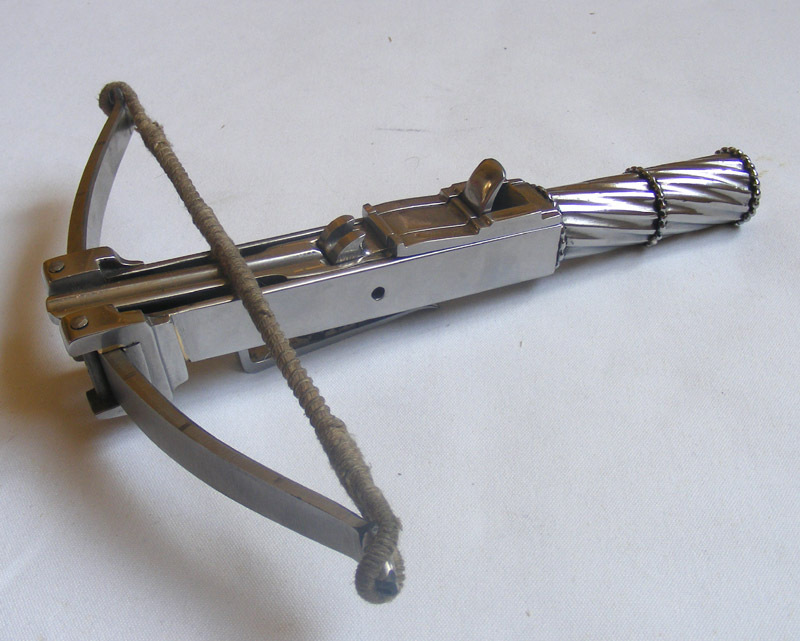 Ballestrinos were small, powerful crossbows commonly called 'assassins bows' that were popular in Italy and Spain in the 15th and 16th centuries. I am not quite sure what they were for and my particular opinion is that they were either executive toys or self defence weapons but personally don't believe they were for assassins as a trade group as such, although I guess they could have been used for this. The bows are clearly very powerful, though with a short powerstroke they won't deliver what a full size bow would. This particular bow has been tested at 320lb at 44mm (1 3/4"). I have wondered how powerful they were and now I know, though this is perhaps not as powerful as some. There are very few of these bows existing and the only one I know vaguely near to me is one in RA at Leeds; all the ones I know about have very different trigger systems and are visually quite different. I think that there were not enough of them made to fall into standard patterns which explains the variety of styles. They all have a common layout in that they have a trigger block that slides forward and engages the string and then is drawn back using the inbuilt screw in the handle. I have also wondered what they shoot. There is a lot of power in this bow, but the powerstroke is short, is it for playing or for defence?. In a nutshell I cannot make up my mind. The one in the RA has a groove so you can see the approximate diameter of the bolt and I estimate no more than 6mm. 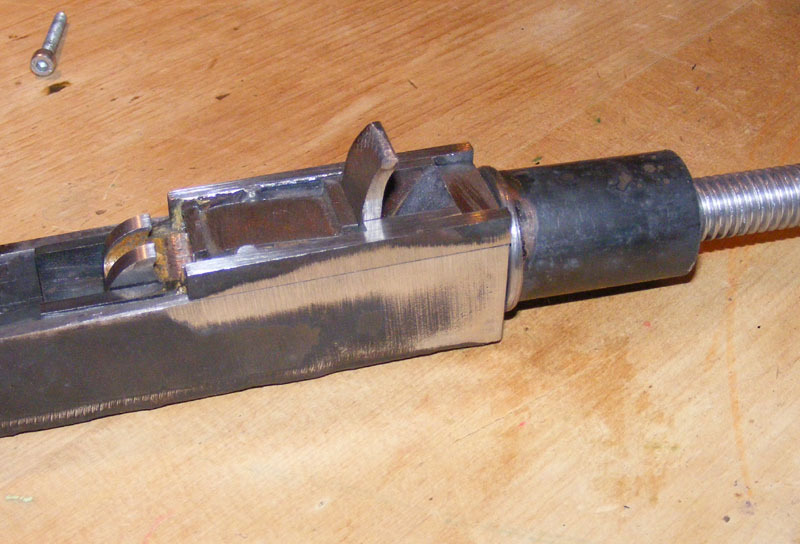 This bolt could be of normal construction but would weigh about 6 or 7 grams (1/4 oz) but as steel bows have a maximum return rate that is quite low the bolt would neither have much impact energy or velocity but an all steel bolt would have the impact energy and most of the velocity so that is where I am leaning at present. I don't know of any bolts for these in existance. Most of these bows are extensively decorated, etched, gilded, inlayed etc but some were more utilitarian. The one at the RA is particularly utility. It looks like it was machined and the trigger block is stuck on top in a rather ugly manner and to top it all it looks just like an industrial micro switch, complete with a slot head screw, but some of the expensive ones simply had a wing nut to load them which is pretty crude too. I have decided that this lack of standardisation and extant examples allows me a little freedom to make something I would like to make. Any way the intro essay is now over but hopefully this will allow me to answer a few questions I have been wondering about. The bow started life at 8mm thick this was just too much for me so I took it down to 6mm and it is 220mm nock to knock. 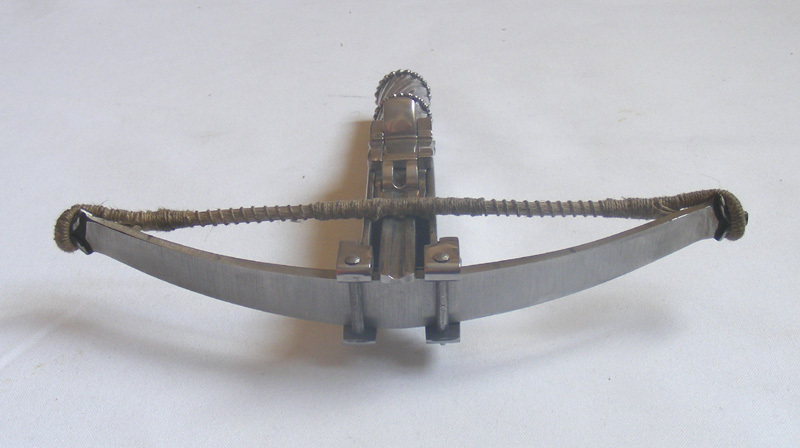 The trigger priciple is the same as the one at the RA, but I reconfigured it so that it sits withing the bow body rather than above it which will make the appearance neater and less industrial and to my eyes less modern. 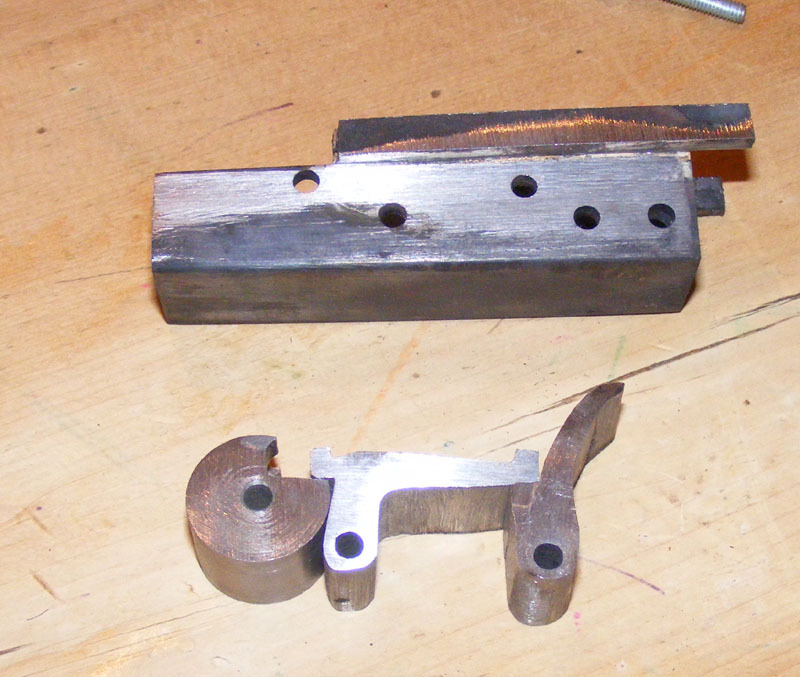 I have made the trigger mechanism and started the body and integrated the screw. I hope it intrigues you as much as does me. It's really funny to see you post this now, Tod, as I was almost going to contact you two weeks ago and ask if you had an interest on taking one on as a commission. I didn't want to bug you with more stuff, though, so I figured I'd wait. Needless to say, I'm very interested to see more. I love seeing the in-progress mechanism; I can't wait to see more! Todd, great looking Balestrino, I can't wait to see it fully constructed. Are you going to make some steel bolts as well? Any idea of the range of these bows? Any idea how lethal they are? Are there any period documentation about them being used to kill / assassin? The following Russian site (I think its Russian) shows pics of most of the Balestrino's above plus the one from Leeds (Royal Armouries that Todd mentioned). The Royal Armouries Balestrino is towards the bottom. When you translate the page using google its title is "That late arbaletik from Leeds"
The attached pictures are from the book "A Guide to the Crossbow by W.F. 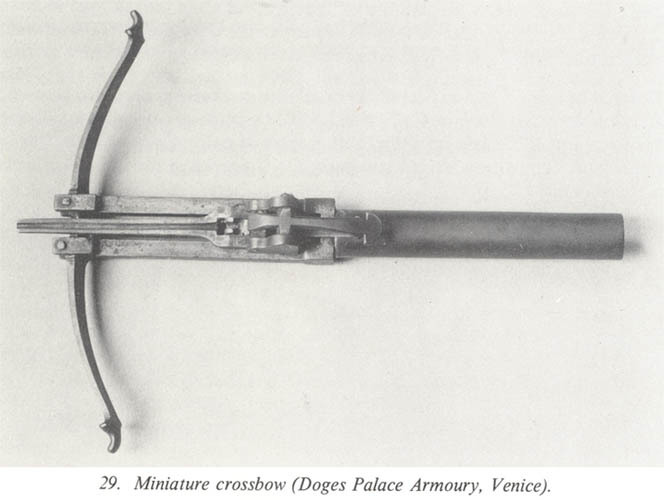 Patterson", pages 105 to 107 that deal with the Balestrino (miniature crossbows). I hope they are pasted in order. Pic 3 - Text, starts with "However, this prince...."
Pic 5 - Text, starts with "In the city...."
I think all of the articles relate to the Balestrino type crossbow. According to the Bibliography they are all illustrated. Thanks for the interest and I must say I am looking forward to how this develops and thanks for the research Danny. I have come accross all but one of the original bows (the Polish one is a repro) but interestingly the one I have not seen is the one with the steel string. I have wondered what the strings were as it has to be thin but the power is very high for a string of this thickness and I did wonder if the strings were steel and one at least was. I have done a little string research for longbows with Steve Stratton. He knows a great deal and has researched a great deal and unfortunately my input did not really take his work any further, but it did lead me to think that these strings could not be hemp so I thought perhaps silk or failing that steel. 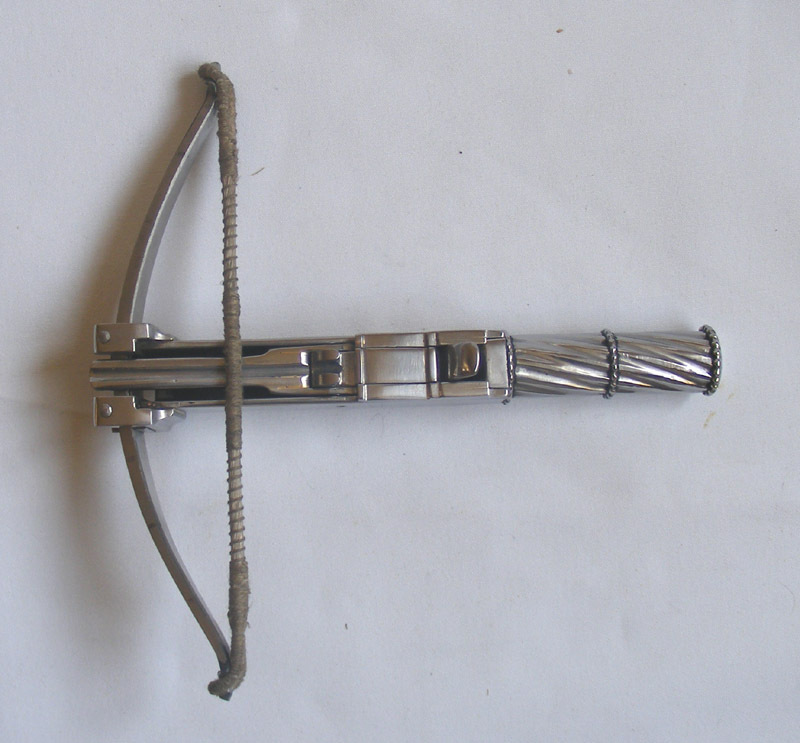 I have opted to cheat on this bow and have used a linen serving but a modern bow string fibre for the body. In essence at the moment I am more interested in the bow than the string and so am going for that aspect. I will make the bolts and will try all steel with a solid head, hollow shaft to try and get some semblance of balance and thin copper flights. This will be my first take. I do think wooden bolts will not give the impact potential of this bow and solid steel ones will have dreadful balance and will not fly well. I don't suppose this matters at point blank, but at anything over a couple of feet the bolt will have to have some aerodynamics and the longer you want the range the better this needs to be. As for range - who knows? for accuracy it will be as good as a six gun shot from the hip as the stance would be similar, so not very good. The trigger on the bow will be heavy so this will not help either. It will need to be heavy as there will be a fine line between locking shut and self discharge so I will have to opt more on the locking shut side as the other option is not good. For this reason I have also opted to make the entire bow 'field strippable' to allow for inspection of the sears and also because it is fun. The actual range, rather than accuracy is also a complete unknown. Assuming I can make the bolts fly well, then I would expect a 150-200yds/meters. But bearing in mind you will loose a bolt everytime you do this and then not know where it landed then I doubt I will ever find this out. How lethal? Again unknown. It will not be a 'man stopper' like a big bow would but more like a rapier in that it is not likely to stop you immediately, but any deep puncture wound to the torso is very likely to prove ultimately fatal; I would say given a torso hit, then fatal. I suspect the penetration will be a little dissappointing. I read 320lb/5mm diameter and I think of going through 18mm/3/4" ply but due to the short stroke this is not likely to be the case. However if you think of putting a 5mm diameter sharpened rod on your arm (a 5"/125mm nail) and applying 320lb pressure I think we can all see that this will penetrate deeply so at point blank at least it would be formidable. I will keep you updated on the progress. This is a great thread, I've learned a lot about these weapons here and have always been wanting to find out more about them. Would love to see the results of some test-shooting. One point to start with might be to figure out mathematically what is the optimum weight of bolt that will efficiently use the weight of draw considering the short stroke and maximum speed the bow string can attaint. In other words ( something Tod I'm sure you know but I'm bringing up for context for those who might not ) the bolt can't move faster than the speed of the bow string and both a light and heavy bolt will move at similar speed as long as the bolt weight is kept reasonable ( The heavier bolt moving more slowly but any energy lost to a very slight reduction of velocity being a lot less than the energy of a much higher mass going only slightly slower than the lighter bolt ). So one wants to use the heaviest bolt that results in the greatest momentum for maximum penetration. Once the weight of the bolt is established one can ask how best to design the bolt to have this weight and how to distribute the weight ! A) Solid steel bolt with a uniform diameter shaft + the point bringing the weight forward a bit but probably not enough. B) Solid steel shaft but tapered towards the flights or other ways to balance the bolt like your idea of a hollow shaft. C) Hollow shaft but weighted at the point end behind the head by being partially lead filled. ( Easy to tune by adding or removing the amount of lead i.e. trial and error and starting with a little lead, testing performance and adding lead until one gets a good and stable flight up to it's maximum useful range. D) Short section of steel shaft with part of the shaft being wood. No idea if any of these suggestions are historically valid but just trying to find a way to get a heavy boltt weight and balancing it optimally. I wholly agree Jean - except for that fact that I am very much a practical man and those sort of mathematics are I am afraid beyond me so I have to go for practical evaluation; I may rig up some basic form of ballistic pendulum and see what delivers most at impact. Couldn't put it better myself. Basically a heavy bolt (still very light compared to the draw weight) will go almost as fast as a heavy one, so why not use a heavy one? As regards your suggestions for possible bolt designs I basically agree with what was suggested and any I think would be historically permissble as they were all used in some way for missiles that I know of, with the exception of hollow steel shafts. I feel I can go this route if required, as they certainly made hollow tubes and these missiles should fly true so if this were the required solution I feel they would have done it. For ease I will try solid first. The bottom line is that there are no bolts associated with these bows so we just don't know. Going back to strings.........It was interesting to see the steel string shown on the bow. 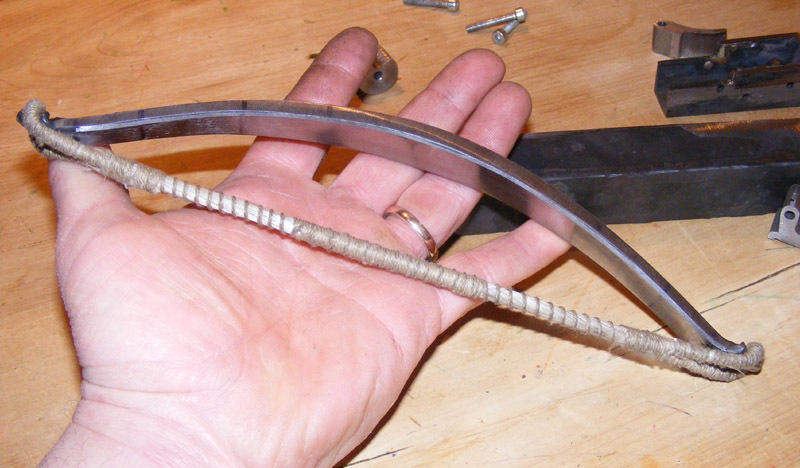 When I was thinking of steel I was thinking of a 5 loop chain like the 'fox bows' shown in Josef Alms book - I had not considered wire. One reason for not considering wire is that it will fatigue quite quickly - 20 shots? . 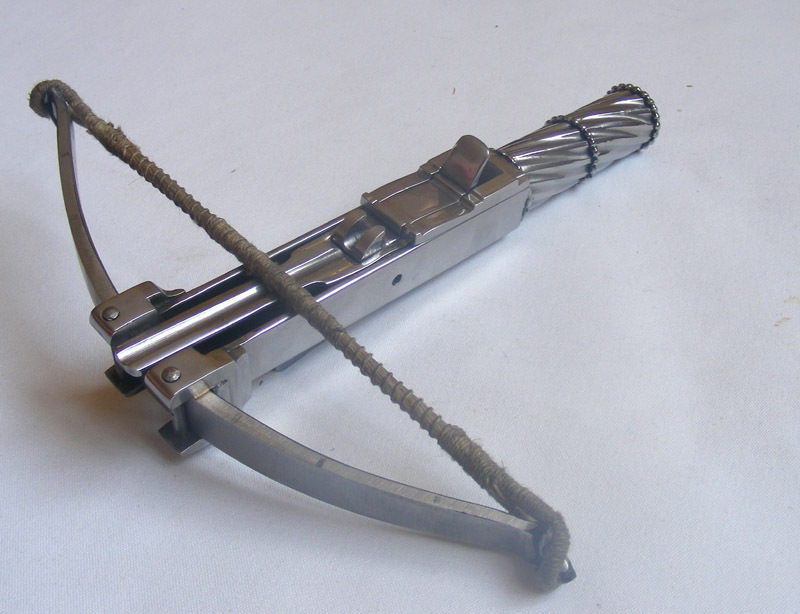 That means that if the string shown is original, and I suspect it is, then the bow is not designed to shoot very often which removes my theory of an executive toy and leaves only it actually being for assassins (which I still doubt) or for defence. So, not to throw around my degree or anything, but I am a Physicist, and the equations that govern this sort of thing are not THAT complicated. If you were willing to give me some data (to be determined), I would be happy to crunch the numbers. I think it would be kind of fun to do this calculation. The next stage and it is getting close. 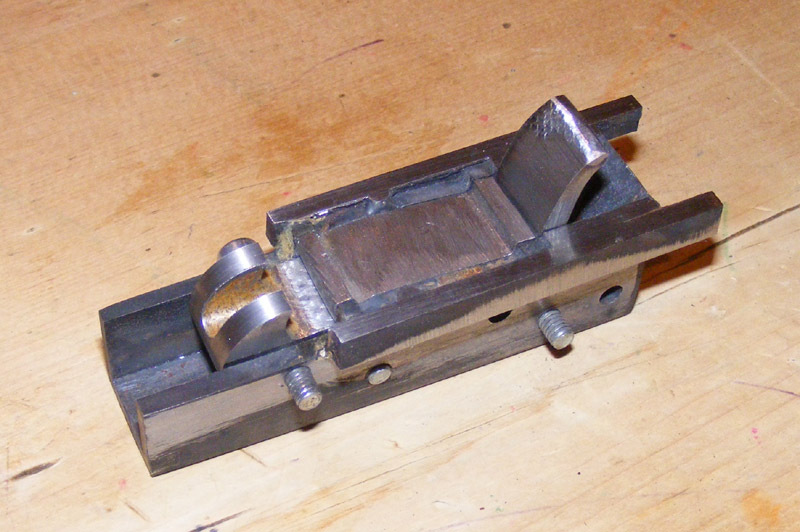 The trigger block is complete and fitted into the stock, the retaining block is fitted and complete and based on the one in Leeds, as is the bolt guide. I have made the whole item 'field strippable' for safety and fun and to this end you may notice the hole in the side of the stock. 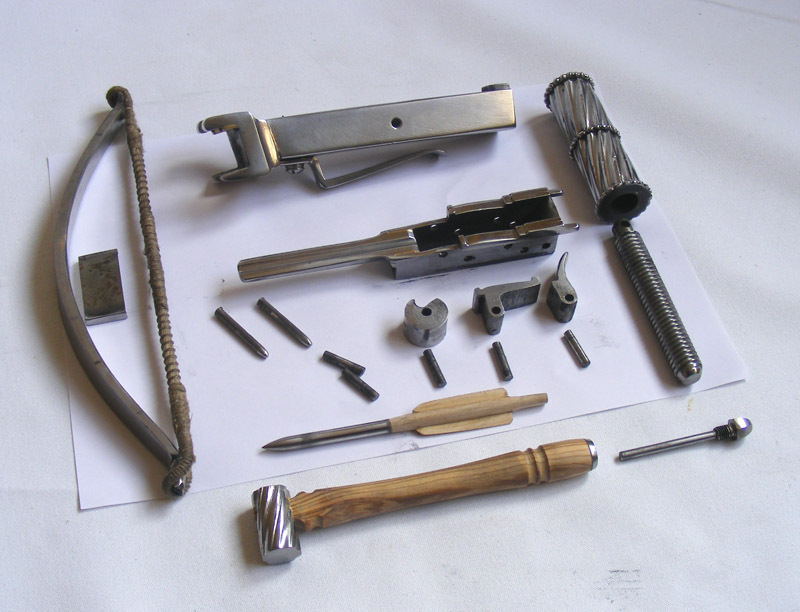 All of the pins for the trigger mechanism are retained by the stock so when the trigger block is removed the trigger parts will be removeable. To remove the trigger block the bow has to be removed by tapping out the pins and the trigger block screwed fully forward, at this point the pin holding the block to the screw can be tapped through the hole in stock and the block will drop out. Obviously I have had a play shooting it, though not at full draw yet. I put in a 5mm diameter solid steel bar about 100mm/4" long and this of course tumbled so can only be used at very short range which makes me think a dagger would be a better bet. I tried putting copper flights on a solid 5mm bar, which had awful balance, tumbled and then got lost somewhere - so no pictures of that. I think I am actually moving back toward a small but conventional bolt with a steel tip, wooden shaft and wooden flights; time will tell. I would love you to do this as it would be interesting to know, but in effect I think my hands may be tied by a lighter weight solution due to flight issues. I may have to go light, but I would like to know if the answer actually is heavy. The stats for this as far as I have are. 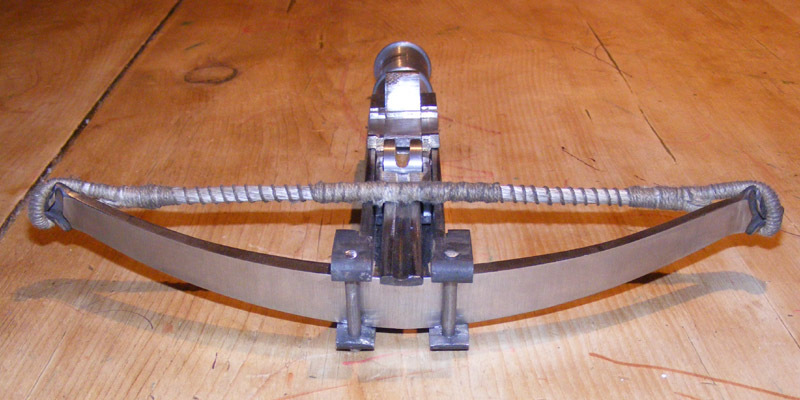 A 320lb bow drawing to 44mm with a reasonably linear draw, perhaps with a slight stack (bias) toward the end. The bolt is 5mm and by 100mm and I have no idea of a figure for the return rate, other than telling you it is spring steel. The trigger is working perfectly. It is self locking in that the more load applied the harder it stays closed, but the actual load needed to shoot is very low, so is very easy with the thumb trigger. Very, very happy with that part, as triggers can be tricky. Overall I am pleased so far; in my opinion it is similar to the RA bow in Leeds but has lost the large trigger block on top that I personally didn't take to and it has the air of an old piece. The bow is 220mm/9" wide and the overall length will be 270mm/10.5"
The equations are simple, but the data is complicated. All you need is the force vs draw distance curve, and "reasonably linear" is close enough, and the speed of the bow. Is "return rate" the usual technical term? This didn't work for me as a search term. High speed video of the bow in action with a bolt of known mass would do it (dry-fired would be best in some sense, but not always a good idea). At least you don't have to worry about the bolt flexing much. Maybe video tape the prod ( drie fired or fired with a know mass ) and if you have time code you can count the number of frames from release to end of string motion. Each frame of tape ( or digital recording frame ) should be 1/30 of a second. This should work if the total time is more than 1/30 of a second with the standard frame rate of video recording. For more precision or if the time is much shorter than 1/30 of a second a camera capable of a higher frame rate and shooting in slow motion there could be many more frames per second than 30. Anyway string speed should be obtainable from length of draw versus time from release to the end of sting motion. Or some sort of timing device triggered at the same time as the release and stopped at end of motion. Easy enough, given a high-speed camera. 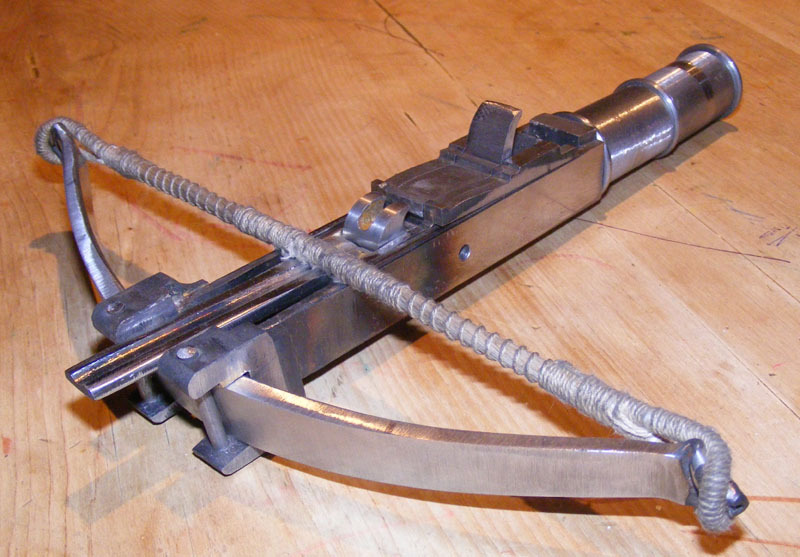 With an efficiency comparable to a bow, this could put that bolt out at approx. 60m/s. 2 metres between frames at NTSC frame rates, which is why you need a high speed camera. For "uniform" behaviour of the bow while shooting, it would be enough to know the time, but this might still be hard to get accurately enough with a camera. There are other high-tech solutions, such as a couple of photodetectors or such. 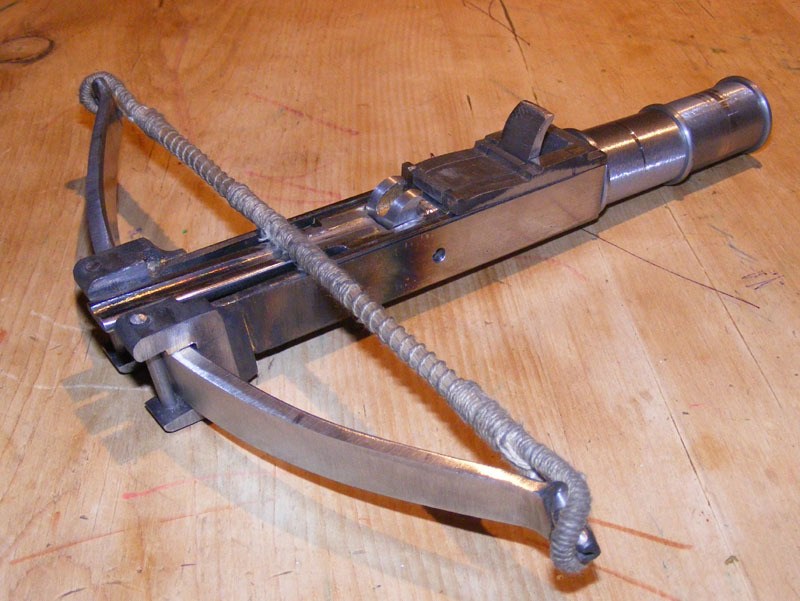 But we can also get this from a measurement of the speed at which the bolt leaves the bow at, and the traditional method for this - already suggested, a ballistic pendulum - will work well. But this still doesn't answer questions such as the aerodynamics and stability of the bolts, penetration for different targets at different ranges, so to really find out the answer, it'll come down to shooting at things. All in the name of science, of course, so any enjoyment will be purely coincidental. So here it is all cleaned up and ready for the TORM (most important show of my year). I fiddled with bolts for a while and settled on perhaps the most obvious direction and one I had not thought of at first. The first half of the bolt or so is solid steel, the rest is holly (dense and tough) this gives a standard balance of a about one thrid from the front and as much weight as works for this size bolt, still allowing it to fly. The result is that the bolt shoots cleanly and has some punch. 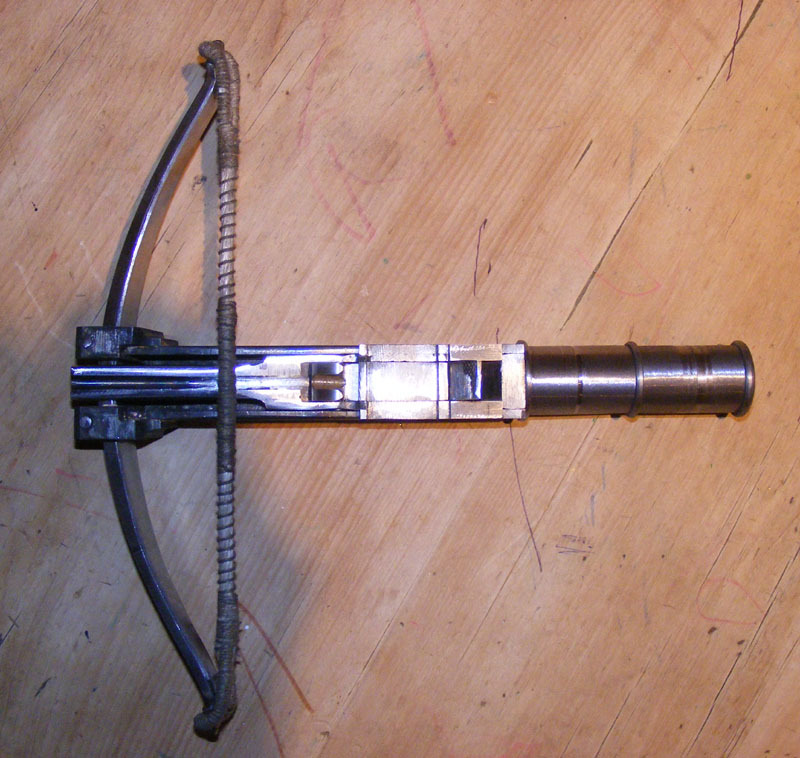 It penetrates a standard straw target boss (oldish one) to about 1.5"/35mm. To me this means it will be fun to play with and could be fatal if it hit your belly or eye or parts of your neck, but otherwise not unless the bolt was poisoned; anyway not reliably so. 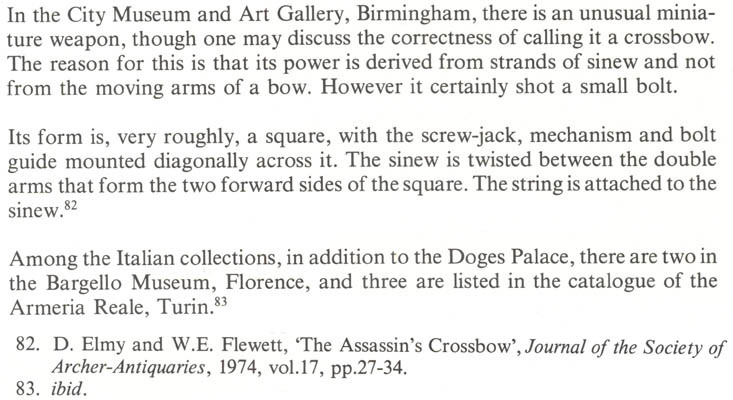 From this I would conclude that the name 'Assassins bow' is probably a misnomer. That said, I would not want to be shot by it. If I get a chance I will try a shot at a leg of lamb or something to get some idea of penetration into flesh. As the bow is easily strippable, I made a hammer and drift to go with the bow and the stripped down picture shows both the hammer (drift screws in the handle) and a bolt. It has been interesting to make and to use and will unfortunately and hopefully find a new home this weekend. but for me it has answered a few questions, confirmed some beliefs and added another couple of mysteries. I hope you have enjoyed seeing its progress. I've followed this thread more out of curiosity than anything, but seeing the finished product in all it's shiny, corkscrewy glory, I'm mesmerized. Do we get to see it in action? WOW!!!! I am not very familiar with crossbows. That is a very awesome design on the firing mechanism. I like how it would be easily reset from the top of the exterior. Would the trigger be actuated with the thumb? I feel like this weapon is designed more for close quarters fire, with the bolt ramp being angled upward. Very beautiful weapon! Congratulations! That really is a fantastic toy! Thanks for showing it in such detail! Great stuff. If I ever strike rich, that would be my office toy of choice! Great looking bow, any chance you can post a pic of the bow cocked with a bolt in the groove ready to shoot? Do you have final dimensions and weight on the bow and bolt? How firmly does the bolt sit in the groove? For example does the bolt dislodge / fall out if you are running with the crossbow cocked?